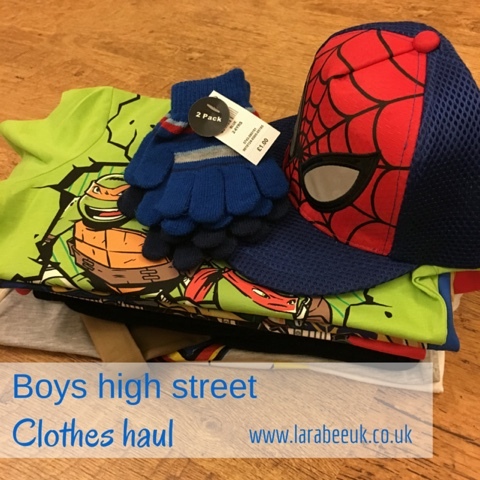 I keep forgetting to share clothes haul's when I get things for T, so after I went shopping yesterday I decided that I'd share this haul with you straight away. This haul is from Primark, BHS and Debenhams. Let me just say, this was my first visit to Primark - wow! What an amazing place, nothing like the Primark I remember from my youth! I have just realised that the joggers in this photo were actually from BHS so I'll put details below. T chose this hat for himself, he doesn't really need a cap bright now but will need one in the spring/summer for nursery so at £3.50 we put this in our basket! We've needed some vests for ages but I can never get any in T's size with a character he likes or plain, so I picked up 2 packs at an unbelievable £2.80 each. The first thing I noticed about them was how long they are, brilliant for tucking into trousers. 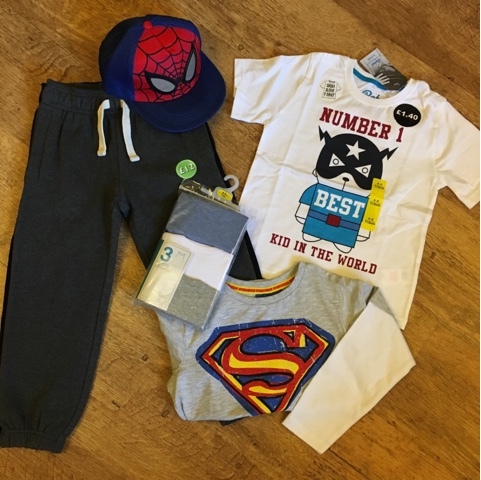 I let T choose a couple of T's I must admit I really don't like the 'best kid in the world' one but he was drawn to the super hero design and at £1.40 I wasn't going to put up too much of a fight, it will be fine for nursery. There are loads of different designs all for £1.40 so I'll be going back when I get T's Spring/summer clothes for nursery. The long sleeve superman T was £5, the sizes come up really big too, so he'll get. Lot of wear from this. 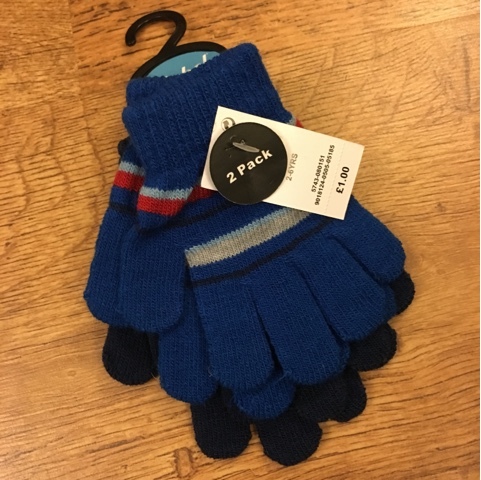 I forgot to include some gloves that T picked up too, 2 packs for £1, now I can make sure we literally have a pair of gloves everywhere as T is always loosing them - particularly at nursery. 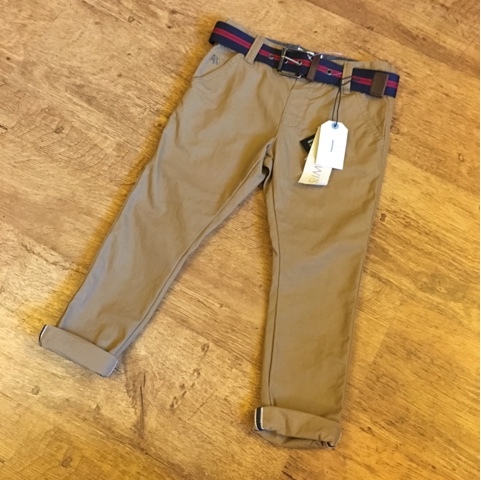 The next shop I visited was Debenhams, we had something to take back, so I got T these gorgeous slim fit chinos from the Jasper Conran Junior J collection. They were £18 but really good quality, the sizes came up a little small, these are age 5 and apart from the waist (which is adjustable) fit perfectly, I think I'll roll them up towards the summer so they are more ankle length. But we'll see. Our BHS haul was slightly more pricy, but we had a credit note and so I let T choose almost what he wanted! 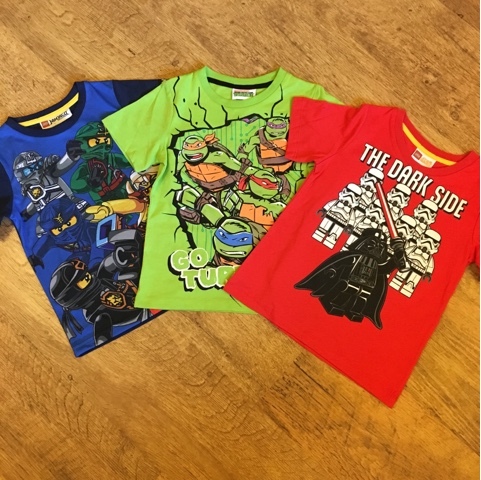 He went for 3 character T's at £9 each, they are really well made and great quality but I think a little bit expensive, I certainly wouldn't be sending him to nursery in these! We also picked up 2 pairs of joggers for £12, I've wanted a couple of pairs for him for the weekend, these are lovely quality and came up quite big (much bigger than sainsbury's) so he'll get lots of wear from these. I hope you liked my little clothing haul, I plan on doing more of these when we update T's wardrobe with the seasons.